Indian birds › Large hawk-cuckoo › Oriental bay owl - Phodilus badius. The oriental bay owl (Phodilus badius) belongs to the family of barn owls, Tytonidae. These owl species are distributed in Northeast India, Myanmar, Thailand, Vietnam, Cambodia, Laos, Southern China, Malaysia, Philippines and Indonesia. 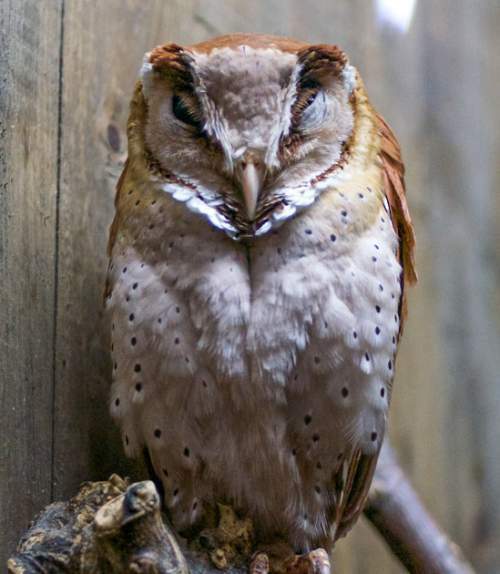 These oriental bay owl species inhabit evergreen forests, foothill forests, mangrove forests and deciduous woodlands. There are four recognized subspecies of these birds. The four recognized subspecies of Phodilus badius are: P. b. parvus Chasen, 1937, P. b. arixuthus Oberholser, 1932, P. b. badius (Horsfield, 1821) and P. b. saturatus Robinson, 1927. 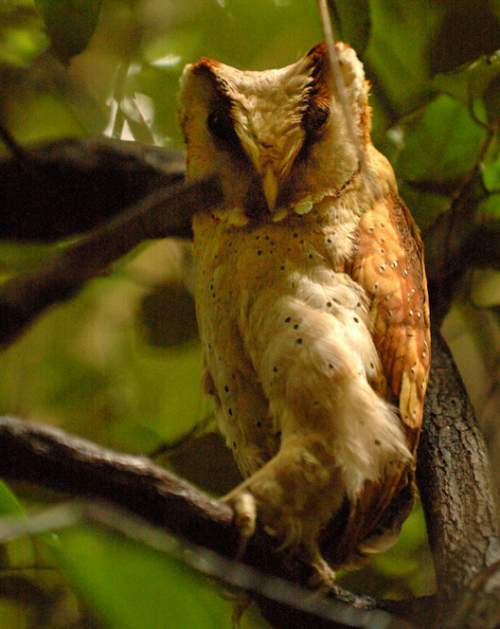 Phodilus badius is closely related to P. prigoginei (African bay owl) and P. assimilis (Sri Lanka bay owl). The oriental bay owl is a small nocturnal bird, measuring 22 to 30 cm in length. It is short-winged and short-tailed. The ear-tufts are short and project out from the sides of head. The facial disc is heart shaped. The upperparts are rufous and spotted. The scapular feathers are rusty brown. The underside is whitish brown with sparse black dots. The bill is creamish. Their call is a loud, eerie, whistling sound. The oriental bay owl subspecies P. b. saturatus is distributed in Northeast India, Myanmar, southern China, Vietnam, Thailand, Cambodia and Laos. Their occurrence in Nepal, Bhutan and Bangladesh is unconfirmed. The populations in Singapore and Philippines are extinct. The owl subspecies P. b. badius is distributed in southern Myanmar, southern Thailand, Malaysia and Greater Sundas Islands (Indonesia). The subspecies P. b. arixuthus is distributed in Middle Natuna Islands (Indonesia). The subspecies P. b. parvus is distributed in Belitung Island (Indonesia). These owl species inhabit submontane and montane forests, temperate forests, foothill forests, subtropical or tropical mangrove forests, dense evergreen primary and secondary forests, evergreen wooded areas, hillside forests and valley woodlands. They prefer elevations from 200 to 1500 meters and also nearness to waterbody. The diet of these owl species includes large insects (beetles, grasshoppers, cicadas etc) small mammals (bats, rats and mice), birds, snakes, lizards and frogs. 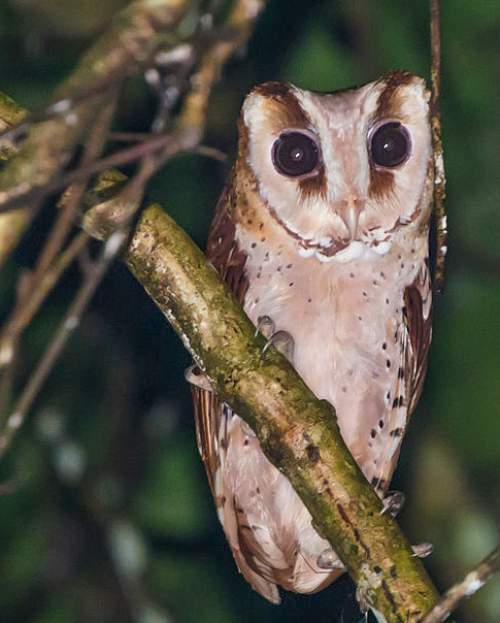 The breeding season of these oriental bay owl species is from March to May in northeast India. In Indonesian islands the breeding season is from October to December. These oriental bay owl species are mostly sedentary and are residents in their ranges. Post breeding dispersal of juveniles takes place. They may make local movements for feeding and breeding. The global population size of the oriental bay owl has not been quantified. The overall population size is considered to be stable. These species have large range and population. The owl species does not approach the thresholds for being Vulnerable neither under the population trend criterion nor under the population size criterion. The IUCN (International Union for Conservation of Nature) has categorized and evaluated the oriental bay owl species and has listed it as of "Least Concern". The CITES (Convention on International Trade in Endangered Species of Wild Fauna and Flora) has listed these owls under Appendix II. Current topic in Birds of India: Oriental bay owl - Phodilus badius.